When Pope John Paul II chose Denver for World Youth Day 1993, skeptics were aghast. Colorado was an empty square in the middle of nowhere. A second-tier city with a Ku Klux Klan legacy, Denver was planted in the most “unchurched” region of the United States. It was more than 1,000 miles from any historic center of Catholic life. It had all the warning signs of a disaster. Critics worried that it would break the finances of Church and city. A few tens of thousands of visitors might turn up, at most. They were wrong — and not just “wrong,” but wildly so. An ocean of young people converged on the city, the crime rate dropped to nearly zero during the week, and the final papal Mass brought together as many as 750,000 pilgrims. World Youth Day profoundly changed the local Church, the city and the state. It sparked an energy that continues more than 20 years later. The change took time. There were no miracles of the sun. No sudden spike in baptisms. No surge in Mass attendance or priestly vocations. A year after the event, some people wondered if the whole thing had just been a very big party, with some religion thrown in. But over the next few years, the spirit of the place gradually came alive in dramatic ways. A generation of Catholic young adults had found their faith, the Pope, and the presence of Jesus Christ in a life-changing way at World Youth Day. And as time went by, the local Church served as a tractor beam for scholars, teachers, seminarians, youth ministers, new apostolic communities, ministries and movements, young families and dedicated Catholics from around the country. To put it simply: World Youth Day remade and reignited the Church in Colorado. Two decades later, the fruit of that conversion is still being harvested. And if a miracle could happen in Denver, the same miracle might happen — with God’s grace and a lot of work — almost anywhere else. Three years ago, the Holy See asked if Philadelphia would stand as one of the possible sites for the World Meeting of Families in 2015. Saying “yes” wasn’t easy: At the time, Philadelphia’s local Church faced very serious problems. Yet our priests and laypeople warmed to the idea immediately. From the start, public officials and business leaders actively committed their help. In September, with as many as 15,000 visitors expected for the family congress, and more than 1 million for the closing papal events, the economic impact for Greater Philadelphia could be extraordinary. For the Church, this global meeting offers a chance to renew Catholic life in the city where our nation began. Of course, Philadelphia 2015 is a long way from Denver 1993. A mass gathering of families is different from a meeting of young adults. Colorado was largely unchurched. Pennsylvania has deep religious roots. The Church in Colorado was small and young. The Church in Philadelphia is large in numbers but older in her demographic profile. She also has a much longer legacy of social service and organized presence in the community. Most importantly, today’s world is very different from even 20 years ago; but not nearly as different as the world will be 20 years from now. Marriage, family and the raising of children with a strong faith — these things are under great pressure today from the surrounding culture. The future in Philadelphia and worldwide will have big challenges for anyone serious about being Christian. It will need a new generation of disciples formed by joy and perseverance. The family is where new life begins: new life for the world; new life for the nation; new life for the Church. It’s where we learn love and patience, and how to work with others in peace. Encouraging this new life is the purpose of the World Meeting of Families. It’s the reason Pope Francis is coming across an ocean to Philadelphia. In exactly two months — barely a heartbeat in the life of a community — the Church in Philadelphia will celebrate the joy of the family with families from across the globe. We’ll bring to it all the exuberance of a great American city; all the excitement, energy and enthusiasm we feel in our hearts. The World Meeting of Families is a moment for new beginnings and a new spirit of hope. Don’t delay. Register now. And then please join us for an event that will be remembered — with delight and gratitude — for decades. 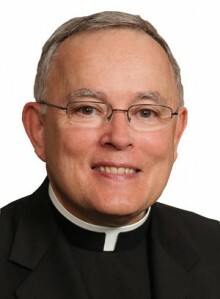 Keeping Archbishop Chaput in prayer. In the midst of all the details, planning, and stress, a blessed anniversary of his episcopal consecration today in 1988! ad multos annos! I just hope the papal visit is in better shape than the local headlines indicate–8’fences, portajohns,parking bans,transit restrictions, transit site meltdown, bridge closings… I hate to say it, but it reminds me of a genu-wine Philly Phiasco: think Rizzo, Bicentennial. At the very least DO NOT IMITATE that. Some reports have indicated that when the homeless who inhabit the Parkway at night are removed for the pope, pilgrims with better gear will be able to camp out in nearby parks, which is never allowed. What a welcome that would be for Francis. Good luck, I hope all goes well. Keeping a close eye on the “master of disaster” who appears to be in charge. What a way to describe a papl visit.